\ \Adam Hamilton, P.E., president and CEO of Southwest Research Institute, will share his insights Sept. 27 as the first speaker of the 2016-17 Forum on Entrepreneurship Breakfast Series. The event – hosted by the Meadows Center for Entrepreneurial Studies at St. Mary’s University – will be held at Norris Conference Centers in the Park North Center. Registration, networking and breakfast begin at 7 a.m., followed by the program at 8. In October 2014, Hamilton became the fourth president in the history of Southwest Research Institute. Founded in 1947, SwRI is one of the most prominent independent, nonprofit research and development organizations in the United States. Hamilton has been a leader in government and industry for three decades. Previously, Hamilton was founder, president and CEO of Signature Science, LLC., which specializes in advancing national security, biotechnology, chemistry, environmental science and engineering. 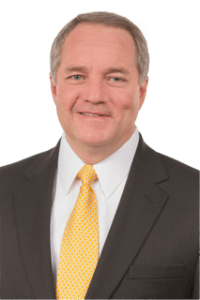 He currently serves as chairman of the organization, now a SwRI subsidiary in Austin. On Dec. 1, the Forum Breakfast series will return to the Pearl Stable of the Historic Pearl Brewery, with featured speaker Robert Kaplan, President of the Dallas Federal Reserve. The Meadows Center for Entrepreneurial Studies fosters innovation, entrepreneurship and creativity with the intent of empowering students to pave their road to success with an emphasis on the characteristics and values of a Marianist education. The purpose of the Forum on Entrepreneurship Breakfast Series is to offer the larger San Antonio community and students of St. Mary’s University a forum to hear from some of the most talented individuals in the entrepreneurial space. Funds generated from the series support student scholarships and encourage entrepreneurial activities in San Antonio and the region. Past speakers include Daymond John, “Shark Tank” investor and founder of FUBU; Colleen Barrett, president emerita and corporate secretary of Southwest Airlines; Stuart Parker, CEO of USAA; Paula Gold-Williams, CEO of CPS Energy; and Bill Greehey, chairman of NuStar Energy, L.P.
Hamilton earned a bachelor’s degree in Aerospace Engineering and a master’s in Engineering, both from the University of Texas. He is a professional engineer and has received certifications from the Department of Homeland Security, American College of Forensic Examiners Institute, Texas Commission on Law Enforcement, and others. He achieved the rank of Lieutenant Commander in the Texas State Guard Maritime Regiment and has served as Deputy Director for Risk Assessment for the Texas Engineers Task Force on Homeland Security. Hamilton has received the Texas Outstanding Service Medal from the Texas State Guard, a Corporate Achievement Award from Radian, and the Exceptional Service in the Public Interest honor from the FBI. He holds or has held leadership positions for the United Way of San Antonio and Bexar County; Greater San Antonio Chamber of Commerce; UTSA Advancement Council; San Antonio Medical Foundation; Texas Biomedical Research Institute; American Society of Mechanical Engineering Industry Advisory Board; Academy of Medicine, Engineering & Science of Texas; Greater Austin Crime Commission; and the Office of the Texas Attorney General’s Training Advisory Board.